Manage all of your projects from one place. All the tools you need to keep your projects on track. 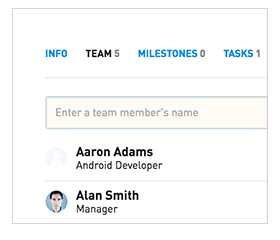 Assemble your team on the Project page, and then start scheduling their tasks. Define milestones and phases for your project. These appear on the schedule at the top of the day to ensure your team doesn't miss a beat. The PM owns a particular project. They have full edit rights to manage the assigned team's tasks and time. There are two types of projects available. Separate the ones that pay the bills from the ones that don’t. 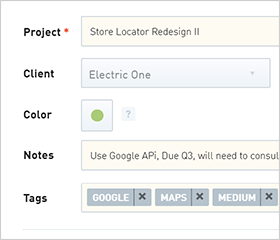 Group projects together by their client for easy sorting, or add custom tags to identify them later on. 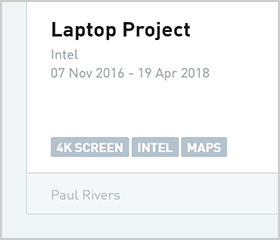 Add notes to give your team the information they need to get things done. Include links to reference documents or other helpful info. 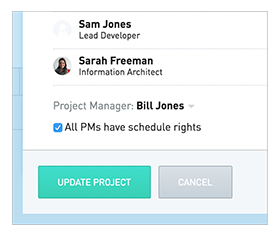 It's simple, yet robust, with all the right features we need to manage our team's time. 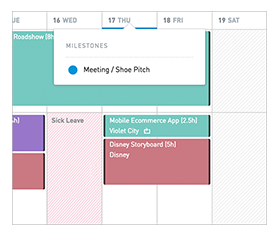 Manage your project from the schedule with drag and drop task allocation. 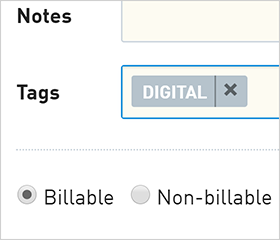 Our robust reporting will keep track of all of your project hours and costs.